in Northern Nigeria including Abuja. Kidnapping was also on the rise, especially in the South-east and South-south regions. President Muhammadu Buhari during his swearing in, May 2015, promised Nigerians that his administration will tackle and bring an end to the activities of Boko Haram and insecurity in other regions. For Mr. Buhari, tackling Boko Haram and achieving maximum security for Nigerians was his primary campaign promise. Upon assuming office on May 29, 2015, the president ordered the immediate relocation of the Military Command Centre from Abuja to Maiduguri, Borno State, in June 2015. Since then, the government has largely been able to curtail the activities of the terror group and ensured no attacks occur outside Adamawa, Borno and Yobe. However, while results are being achieved in the fight against Boko haram terrorists, residents of the North-east still suffer several attacks by terrorists in the region. Other Nigerians are also suffering all forms of security challenges ranging from kidnapping, armed robbery and inter-communal clashes across the nation. In November, for instance, over 200 persons lost their lives including soldiers and other security operatives in various Boko Haram, communal attacks, and by other armed bandits. In November 21, at least 80 persons lost their lives in Adamawa state in two separate attacks that took place at different communities, hours apart. The highest casualty recorded in the attacks was in Mubi where 50 people were killed during Islamic morning prayers by a suicide bomber. At least, 30 women and children were also killed in a separate attacks launched by militiamen in Numan Local Government Area of Adamawa State. It was reported that the Mubi attack was carried out by a young man. Residents, who spoke to this newspaper said they saw many lifeless bodies on the ground and dozens injured in the aftermath of the blast. “As people converged on Massalacin Madina at Anguwan Shuwa to observe Subh (morning prayer), an unknown man rammed himself into the mosque with IEDs , killing many people,” a resident of the area who identified himself as Bello explained on how the attack occurred. Also, police confirmed the killing of at least 30 women and children in Numan Local Government Area of Adamawa State, on November 21 by suspected militiamen. Residents and security sources said the attacks on the mainly Fulani settlements were launched by armed gangs suspected to be of the predominant Bachama ethnic group in the area. They said the death toll was possibly higher. An affected resident, Oriwa Hammadu, said the militia members chanted songs as they launched attacks on the settlements in Shafaran, Shawal, Gumara, Kikam and Kadamti villages in the area. ‘’The attacks came when all the men were out of the areas. Many had gone to the market and a wedding ceremony in Mayo-Belwa, so they took us by surprise,” said Mr. Hammadu. In November, at least 46 persons lost their lives including 17 suspected Boko Haram terrorists from different attacks in Borno State. The highest casualty recorded in the state was that of the suicide bombers’ attack in Maiduguri the state capital on November 15. Police confirmed that at least 18 persons were reportedly killed and 29 others injured when two suicide bombers attacked a crowded suburb of Maiduguri, the Borno State capital. Deafening blasts were heard echoing over the Maiduguri metropolis late in the evening of Wednesday as the suspected Boko Haram attackers detonated explosives. The spokesperson of the Borno police command, Victor Isukwu, who later provided details via a text statement, said the attacks were carried out by four suspected Boko Haram suicide bombers. The second highest casualty recorded in the state was the beheading of six farmers at Dimge plantation in the Mafa Local Government Area of Borno by suspected Boko Haram on November 19. On November 26, the Nigerian Army also confirmed the death of three soldiers in a battle with Boko Haram members after the insurgents invaded an army base and Magumeri community in Borno State. However, the military killed at least 17 terrorists in different confrontations and rescued ‘hundreds of persons’ held hostage by terrorists. The Nigerian Army on November 25, in a joint operation with the Mobile Strike Team, MST, killed 14 terrorists and rescued 30 hostages. 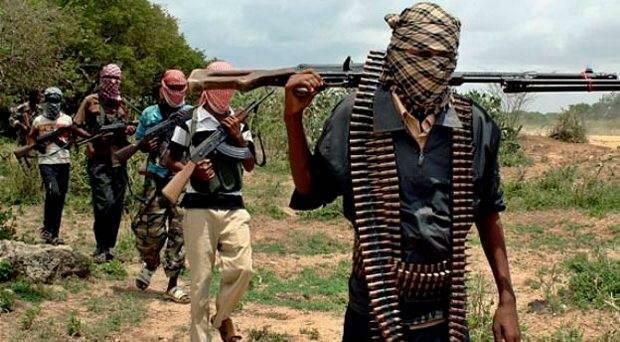 The hostages were rescued from Boko Haram terrorist’s enclaves in Abusuriwa, Newchina, Bonzon, Usmanari, Goyayeri, Shitimari, Gashimari, Awaram amongst other villages in Bama Local Government Area of Borno State. Again, on November 29, Nigerian soldiers rescued at least 212 persons held hostage by the terrorists after they cleared remnants of Boko Haram insurgents from some villages in the northern fringes of the Sambisa forest. According to a statement by the army spokesperson, Sani Usman, the soldiers also captured one Boko Haram commander, “Ameer” of Chawa, Amman Judee, and killed four terrorists. On November 26, a 5-year-old boy was reportedly killed in a Boko Haram attack on Magumeri town of Borno State. While Boko Haram insurgency is still a major security challenge this administration is facing, kidnapping activities is also another menace troubling Nigerians particularly those that ply roads across the six-geopolitical zones. The Kaduna-Abuja highway in the northern region is perhaps one of the notorious routes where kidnapping activities are rampant. A former minister of environment, Laurentia Mallam, and her husband, Pius were abducted along Bwari/Jere axis on Kaduna-Abuja highway on October 2. On November 21, a Federal Road Safety Corps, FRSC, confirmed the death of one of its marshals by suspected armed kidnappers on the same highway. The News Agency of Nigeria, NAN, reported how the attack occurred on November 21 at Sabo-Wuse Area on the Niger axis of the highway. The report added that the deceased was traveling in a commercial bus alongside other passengers when the hoodlums struck at about 6.30 a.m.
At least 77 persons have lost their lives via violent attacked by unknown gunmen in different communities in Benue, Zamfara and Plateau States between November 6 and 20. The highest casualty recorded is the killing of at least 40 people in Zamfara. The Police in Zamfara confirmed the killings of many people on November 6 by gunmen suspected to be cattle rustlers at a mining site in Gidan Ardo Village of Bindin district of Maru Local Government Area. The Police Public Relations Officer, PPRO, in the state, Shehu Muhammad, disclosed the development to journalists in Gusau on November 8. Mr. Muhammad, however, said the command was yet to ascertain the actual number of those killed during the mayhem; although residents said over 40 people were killed. The police said investigation into the killings had begun. It also said the anti-terrorism squad of the command had already been deployed to the area to join the Army in trailing the gunmen. Similarly in another separate attack, at least 25 people were killed on November 20 when gunmen stormed three communities in the state. The lawmaker representing Zurmi West in the Zamfara State House of Assembly, Yusuf Moriki, told the News Agency of Nigeria that the incident occurred at Dole, Tudun Bugaje and Kwangwami communities in Zurmi Local Government Area. Mr. Moriki said 25 were killed, while many others were injured during the attack. On November 17, another tragedy befell Zamfara State as about 40 people were kidnapped by gunmen suspected to be cattle rustlers. Similarly on November 7, eleven people were shot dead by gunmen along Rim, Riyom Local Government Area of northern Plateau State. Other attacks by gunmen include the killing of three persons in Ukanafun Local Government Area of Akwa Ibom State on November 19 when gunmen stormed the country home of the Commissioner for Local Government and Chieftaincy Affairs in the state, Udo Ekpenyong. Again, on November 17, a similar incident occurred where armed men, riding a motorcycle shot dead a policeman and two other persons at a filling station in the local government area.